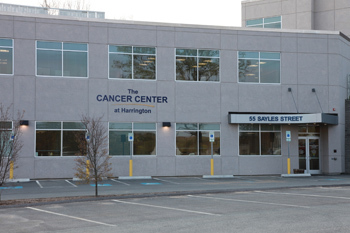 The Cancer Center at Harrington is a two-story, cancer treatment and hematology center located at 55 Sayles Street on the edge of the main Harrington Hospital campus in Southbridge, Massachusetts. The opening of the center in June 2009 means cancer patients can get high quality, patient-centered care close to home, without having to travel to Worcester, Boston or Springfield. The center is jointly operated with 21st Century Oncology, but services are extremely comprehensive, tailored for each patient’s individual needs and treatment plan. The first floor offers the latest in radiology treatments, such as Intensity Modulated Radiation Therapy (IMRT) and Image-Guided Radiation Therapy (IGRT), which focuses the radiation treatment on the tumor and spares the normal tissue. Our chief radiologist is TJ Fitzgerald, affiliated with UMass Medical Center. The second floor offers infusion and chemotherapy services, hematology services, care management, and many support services including counseling, laboratory, diagnostic imaging, surgical specialists, genetic counseling, a resource room and more. The second floor of the center is also where patients can be seen for pain management and palliative care.